With positive training, we emphasize teaching dogs what they should do to earn reinforcements, rather than punishing them for unwanted behaviors. • Focus on teaching "do" rather than "don't." For example, a sitting dog isn't jumping. 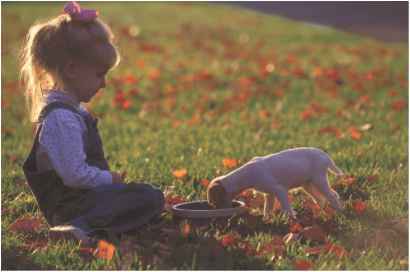 • Use positive reinforcers that are valuable to your dog and the situation: A tired dog values rest; a confined dog values freedom. • Be a consistent leader. 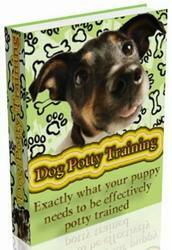 • Set your dog up for success by anticipating and preventing problems. • Notice and reward desirable behavior, and give him lots of attention when he is being good. • Train ethically. Use humane methods and equipment that do not frighten or hurt your dog. • When you are angry, walk away and plan a positive strategy. • Keep practice sessions short and sweet. Five to ten minutes, three to five times a day is best. when the punisher isn't around and the coast is clear, the same behavior he was punished for—such as raiding a trash can—might bring a self-delivered, very tasty result. The punished dog hasn't learned not to misbehave; he has learned to not get caught. Does punishment ever have a place in dog training? Many people will heartily insist it does not. But dog owners often get frustrated as they try to stick to the path of all-positive reinforcement. It sure sounds great, but is it realistic, or even natural, to never say "no" to your dog? A wild dog's life is not all positive. Hunger and thirst are both examples of negative reinforcement; the resulting discomfort motivates the wild dog to seek food and water. He encounters natural aversives such as pesky insects; mats in his coat; cold days; rainy days; sweltering hot days; and occasional run-ins with thorns, brambles, skunks, bees, and other nastiness. These all affect his behavior, as he tries to avoid the bad stuff whenever possible. The wild dog also occasionally encounters social punishers from others in his group when he gets too pushy. Starting with a growl or a snap from Mom, and later some mild and ritualized discipline from other members of his four-legged family, he learns to modify behaviors that elicit grouchy responses. Our pet dogs don't naturally experience all positive results either, because they learn from their surroundings and from social experiences with other dogs. Watch a group of pet dogs playing together and you'll see a very old educational system still being used. As they wrestle and attempt to assert themselves, you'll notice many mouth-on-neck moments. Their playful biting is inhibited, with no intention to cause harm, but their message is clear: "Say uncle or this could hurt more!" Observing that punishment does occur in nature, some people may feel compelled to try to be like the big wolf with their pet dogs. Becoming aggressive or heavy-handed with your pet will backfire! Your dog will not be impressed, nor will he want to follow you. Punishment causes dogs to change their behavior to avoid or escape discomfort and threats. Threatened dogs will either become very passive and offer submissive, appeasing postures, attempt to flee, or rise to the occasion and fight back. When people personally punish their dogs in an angry manner, one of these three defensive mechanisms will be triggered. Which one depends on a dog's genetic temperament as well as his past social experiences. Since we don't want to make our pets feel the need to avoid or escape us, personal punishment has no place in our training.